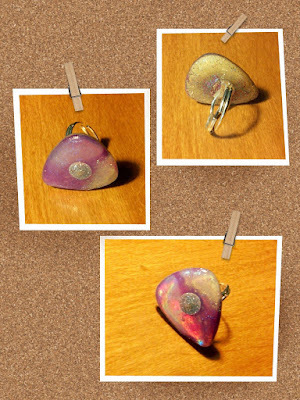 Guitar pick pendant made from a DVD! This glittery, iridescent pick is cut from a DVD and layered in epoxy resin with a silver glitter embellishment. DVD's make a great material for guitar picks for jewelry. They're too thin for just plain ol' guitar picks but they look fantastic as pendants. You'll definitely be seeing more DVD guitar pick jewelry in the future, but until then feast your eyes on my newest ring!